Scottish culture can be divisive. Mrs Pint's family still like to say she got married to a man wearing a skirt. And, while the arrival of bagpipes on a couple of occasions during King Creosote's most recent album sets hearts a-racing at Crafty Towers, there are many who just hear a droning annoyance whenever they are squeezed into life. Still, one thing we imagine most of our readers can agree upon is that a well made Scotch ale is a treat, especially as we head into the colder months. And there will have been few Scotch ales more Scottish than this to come out of Australia. 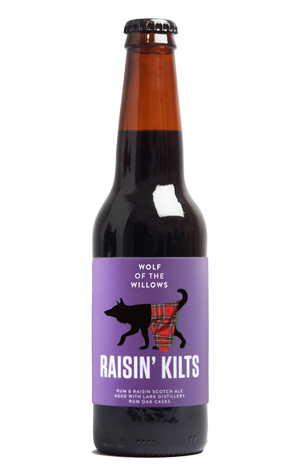 It was created by two men of Scottish heritage, Wolf of the Willows' Scott McKinnon and Lark Distillery's Craig Johnstone (whose names alone will have the unique aroma of haggis wafting around the heads of anyone with synaesthesia) who aged the beer in casks from the Tasmanian distillery. Admittedly, they were casks formerly used for rum, and a dose of organic sun dried raisins went in too – it's technically a rum 'n' raisin Scotch ale. In their defence, adding battered Mars Bars and tablet would have played havoc with the head. Yet, for all the fun and games in the brewery, it's recognisably a Wolf of the Willows beer. Yes, there's some nice toasted and sweet malt flavours. Yes, there are hints of raisins and other dark fruits. Yes, there's a drying, tannic finish and hints of oak. But they're all contained within the sort of tight and lean package we've come to expect from Scott, whatever he adds to the mix.